Spring is a crucial time to be thinking about grass management, as it lays the foundations for the year. But there is more to grass management than just letting your horses graze or restricting their grazing. If done properly, grass is the most high value, low-cost feed you can provide your horse. First and foremost, ensuring good grass management comes down to regularly removing faeces and weeds, as both can pose problems if left to collect. 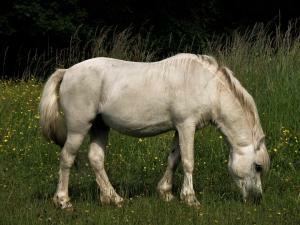 Many weeds are highly poisonous to horses or just invasive to the land, while piles of accumulating faeces can increase parasite burdens and result in overgrazing of the field. You want to make sure nothing limits grass growth so as well as removing weeds and faeces, you need to consider soil compaction (usually caused by heavy machinery and animal hooves), and the nutrient status of the soil. Ideally, the soil pH should be 6.5 and there should be no shortfall of phosphate, nitrogen and potash – all essential for healthy grass growth. If there are shortfalls, you’ll need to apply manure, slurry or artificial fertilisers to replace the missing nutrients. Speak to an expert about this if you're unsure. It is a good idea to harrow the land from March onwards, as this helps aerate the soil and remove dead vegetation. You can then re-seed and fill in any gaps. When the land is dry, promote early grass growth by rolling the ground and flattening the surface where it has become poached. Land poaching becomes a problem when conditions are particularly wet and muddy so, if possible, restrict grazing until things improve. Poached land is the perfect environment for invasive and poisonous weed growth, which is why it needs to be properly managed. Ideally, paddocks should be rotated and then rested for 2-3 weeks at a time to allow them to fully recover. This isn’t always easy but is key to managing grazing. As always, we'd love to hear what you think on this topic, so please get in touch or comment below if you have any tips on managing your fields during the year. Would you recommend rolling and then harrowing or the other way around? I know people who do it both ways but no-one seems to agree on which is best.